The Other Phantom Musical -- Kopit and Yeston's "Phantom"
If you were a fan of Andrew Lloyd Webber’s The Phantom of the Opera, you may be aware of other musical versions of Gaston Leroux’s 1910 novel. Long before it became a Broadway record-breaker, Phantom had been adapted into melodramas, silent films, matinee thrillers, and even a ballet. Ken Hill created a stage musical of Phantom back in the 1970s, a decade before Webber’s megahit. The music from the Hill production combined bits of classic opera melodies with witty (and often silly) lyrics. Andrew Lloyd Webber and producer Cameron Mackintosh watched Hill’s production, thus sparking their own ideas as to how to create their own version. While Sir Webber was developing his Phantom, the creators of the Fellini-inspired Nine were brainstorming ideas for their next project. Composer Maury Yeston and playwright Arthur Kopit chose to adapt Leroux’s novel. Unfortunately for them, as they were finishing up their musical they opened up a Variety magazine to discover that Webber’s next extravaganza was none other than The Phantom of the Opera. (Simpsons fans would call this a “D’oh!” moment). Yeston and Kopit’s financial backers did not want to compete with the man who brought the world Cats, so they abandoned the project. The Kopit and Yeston musical collected dust for a while, but in the early 90s, the playwright was hired to adapt Phantom as a miniseries. 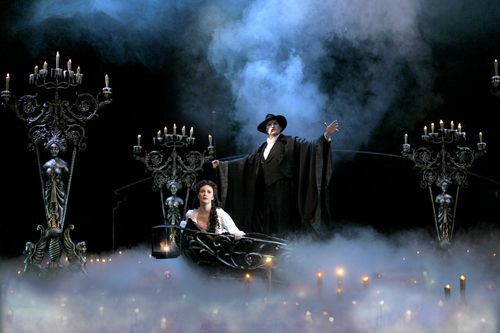 Kopit’s success with the teleplay enabled the duo to launch a production of their Phantom at Texas’ Theater Under the Stars. Although the show has never been on Broadway, it has attained a following, pleasing audiences at regional and community theaters. The stronger songs are given voice by Christine; her solo numbers and her duets with the Phantom are delicate and enchanting. Also, one of the musical highlights of the show appears at the end – a touching duet between father and son. As with many shows, if the performers are not high exceptional vocalists/actors, these songs might seem emotionally forced, even overtly sentimental. The musical’s book follows an interesting structure. 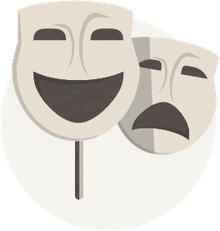 The first act lightheartedly introduces the characters, often playing for laughs. Even the Phantom tells a few jokes. (Sure, a guy gets killed in the first 10 minutes – but somehow the energy is still fun!) The supporting characters are quite cartoony (but they weren’t exactly realistic in the Webber production, by the way). Yet, during Act Two the mood darkens. An impending sense of doom and grief tints each song. Like the Webber version, the final scenes are a bittersweet lament of a love that could never be fulfilled. The most poignant message of Kopit’s script is that the beauty of music alleviates the pain of life’s ugliness. Music makes the journey worth the hardship.